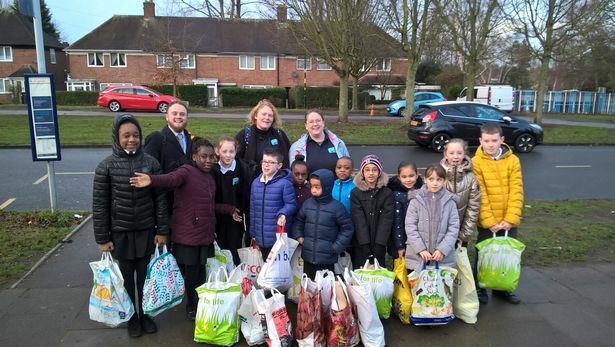 The team of 12 children, aged from five to 11 from Oasis Academy Short Heath wanted to talk to rough sleepers and give them food and warm clothes. When Rigberta Nimoh saw a homeless man in a doorway in Birmingham city centre, she was shocked and immediately knew she had to take action. They had made sandwiches and packed bags and carried them on the bus into the city centre with their teachers on Wednesday 16th January. They hit the streets in the rain, walking from Birmingham Cathedral down New Street to Bullring and across to the markets, giving aid bags to every homeless person they spotted they stopped and chatted with them too. As part of the Pupil Leadership Team at Oasis Academy Short Heath near Erdington, she asked the group to form a plan to help rough sleepers in the city. The group, helped by deputy principal Joe Darnley, sent letters to parents asking them to donate toiletries, hats, gloves, scarfs and food. “Rigberta was shocked, saying she’d heard about homelessness but didn’t realise that it really happened in Birmingham,” said Pam Atwal, who is Safeguarding / Community Leader at the Streetly Road school. “She asked ‘why is nothing happening for them?’ and said we needed to do something about it. “The children were very emotional about giving the bags out, and seeing their reactions was incredible. “He started to cry and said he would never forget that. Deputy Principal Joe Darnley said: “Article 27 on the list is about basic right to shelter. “That’s one of the reasons why the children chose to do this, they wanted something that would have an immediate impact, rather than raising money for a charity. “One of our ethos statements is about hope and that things can change and be transformed. It was good to see this message being passed on by the children. “It wasn’t just a case of dropping off the bags, the children engaged in conversations. “The majority were really excited about the opportunity. “But there are risks associated with the behaviour of some rough sleepers and we did have quite a few parents approach us as they were anxious about what the children were doing. Two parent volunteers from the Friends of Oasis team – Helen Jim and Daisy Coughlan – helped out with the trip into town. Pam added: “There was no aggressive behaviour at all, all the people we approached were just so thankful. “Watching the children’s reaction as the homeless people opened their bags was amazing. Now, lots of other children – and parents – are asking if they can go and deliver aid parcels to Brum’s homeless people. “Lots of people have asked if we can make it a regular thing,” said Pam.